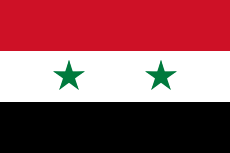 The 1963 Syrian coup d'état, referred to by the Syrian government as the 8 March Revolution (Arabic: ثورة الثامن من آذار‎‎), was the successful seizure of power in Syria by the military committee of the Syrian Regional Branch of the Arab Socialist Ba'ath Party. The planning and the unfolding conspiracy was inspired by the Iraqi Regional Branch's successful military coup. The mandate was feudal in character, and it rested on a semi-liberal oligarchic social base. This system remained unchanged until the establishment of the United Arab Republic (UAR). This system created a class society reflecting urban–rural living patterns. An estimated three thousand families owned half of the land in Syria. The majority of small to medium properties were owned by the middle class. Some two-thirds of peasants were landless. Agricultural revenues were highly skewed – the top two percent of the population received 50 percent of the income, while the middle class (merchants or middle landowning groups), which was 18 percent of the population, earned 25 percent of agricultural revenues. The bottom 80 percent received the remainder. The landowner–peasant alliance was based on class differences, and social antagonism between each other – this would lead to the landowner's downfall. The mandate was dissolved in 1946 because of a British ultimatum to France, and Syria became an independent country on 17 April 1946. The same elite that had governed Syria during the mandate continued in power and they governed in the same manner. The failure in the 1948 Arab–Israeli War led to the downfall of the traditional elite and the rise of the military in politics. 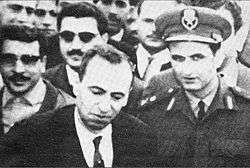 Husni al-Za'im became the first military dictator of Syria in 1949, but in 1950, military officer Adib Shishakli gained power behind the scenes, and by 1953 had established another military dictatorship. The military's introduction to the Syrian political scene destroyed the oligarchy enabling the middle class to participate in Syrian politics. However, while their powers were weakened, the traditional elite retained the majority of the wealth produced. It was in this environment that the ideology of Ba'athism came into being. The Arab Ba'ath Movement was established by Michel Aflaq and Salah al-Din al-Bitar in the 1940s, others who played a notable role in the early stages of the Ba'athist movement were Zaki al-Arsuzi, Wahib al-Ghanim and Jallal al-Sayyid. Akram al-Hawrani founded the Arab Socialist Party (ASP) in 1953 – the Ba'ath Party was established through a merger of the ASP and the Arab Ba'ath Party. Of the 150 delegates to the founding congress of the Arab Ba'ath Party in 1947, the majority were either middle-class professionals or intellectuals. By the 1950s the party had managed to acquire an urban middle class base. However, the Ba'ath Party was not a purely middle class party, and from the very beginning, it sent party cadres to rural areas to recruit new members and form new party organisations. In 1956, the Ba'ath Party organized the first labour protest in Syrian history. While the Ba'ath Party was strong, its decision to recruit members from across society led to tribalism and clientelism within the party. Party leaders then opted to overlook democratic norms and procedures. The Ba'ath Party faced a major dilemma: take power through competitive elections or through forceful takeover. Even the liberal and democratic-inclined founding leaders were partial to forceful takeover, citing the corrupt electoral process. Before taking power, the Ba'ath Party gambled that it would be allowed to share power with Gamal Abdel Nasser in the United Arab Republic (UAR). 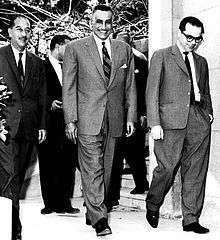 The UAR would prove to be Egypt-dominated, and the Ba'ath Party was forced to dissolve itself, but in 1961 the UAR collapsed because of a military coup in Syria. The establishment and the dissolution of the UAR was a catastrophe for the Ba'ath Party as it divided among those who supported the UAR, those who opposed it and those who opposed or supported the traditional leaders of the party. In 1962, Aflaq convened a Ba'ath Party congress and re-established the party. Several branches had not followed orders and had not dissolved during the UAR years. Instead they had become deeply hostile to pan-Arabist thought and had become radical socialists instead. The military committee, which would launch the 8 March Revolution, shared most of their views. The 8 March Revolution has often been viewed as a mere military coup, but it had many of the ingredients of national revolts from below. The revolution was led by an anti-oligarchical alliance of a radicalised lower middle class, strategic members of the officer corps, marginalised minorities and a significant number of peasants who were mobilised for agrarian conflict. In an international context, the revolution took place because the state boundaries established by France were artificial and the hostility within the newly established Syria to the creation of Israel. The traditional elite that took power in Syria when the country gained independence had come to power during the French Mandate of Syria and Lebanon. The external imposition of arbitrary state boundaries on Syria with no corresponding popular acceptance led to discontent. The national struggle was shaped by ideologies such as Arab nationalism, pan-Islamism and Greater Syrianism. The plebeian character of the struggle, and the radical ideologies, spawned radical solutions to the agrarian problem. The growth of the new middle class in Syria fueled discontent since the traditional elite dominated the agrarian sector – the largest sector of the economy – and created most of the wealth. The new middle class consisted of capitalists and entrepreneurs who opposed the traditional elite – the monopolisation of power by the traditional elite led to the radicalisation of the new middle class. The military, which in many countries is conservative and elitist, became radicalised in Syria because the military wanted greater power, believing that the traditional elite were unable to defend the country. A significant group of military personnel were recruited from the new middle class or from the hinterlands. In Syria, ethnic minorities were often underprivileged, and a specific ethnicity often belonged to a specific social class. The Alawites, the Druzes and the Isma'ilis for instance, were ethnic groups with low social class who began to embrace a radical form of Arab nationalism, e.g. Ba'athism. Without the peasantry there could not have been a Ba'athist revolution in Syria. The new middle class alone could only produce instability, but together with the peasantry, the revolution became possible. The inequality between urban and rural dwellers, together with capitalist penetration of the agrarian sector and the traditional elites' monopolisation of most large revenue sources, led to the establishment of peasant movements who fought for change, or opposed the system. The Syrian branch of the Arab Socialist Ba'ath Party was able to recruit young peasants from radical peasant movements, and because of it, was able to mobilise large sectors of the population. 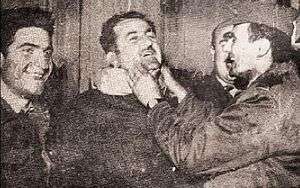 In 1962, the military committee of the Syrian Regional Branch of the Arab Socialist Ba'ath Party spent most of its time plannining to take power through a conventional military coup. The military committee decided it had to capture al-Kiswah and Qatana, two military camps, seize control of the 70th Armoured Brigade at al-Kiswah, the Military Academy in the city of Homs and the Damascus radio station. While the conspirators of the military committee were all young, the sitting regime had been slowly disintegrating and the traditional elite had lost effective political power. ↑ These new members were Salim Hatum, Ahmad al-Suwaydani, Muhammad Rabah al-Tawil, Hamad 'Ubayd and Musa al-Zu'bi. There was a further expansion of the Military Committee in the summer of 1963, but according to Assad the highest Military Committee membership number reached was 13. ↑ The Nasserist cabinet members who resigned were Deputy Prime Minister and Justice Minister Nihad al-Qasim, Finance Minister Abd al-Wahhab Hawmad, Defense Minister Muhammad al-Sufi, Planning Minister Hani al-Hindi, Supply Minister Sami Sufan, Communications Minister Jihad Dahi. 1 2 Hopwood 1988, p. 45. ↑ Hinnebusch 2001, pp. 17–18. ↑ Hinnebusch 2001, p. 18. ↑ Hinnebusch 2001, p. 20. ↑ Hinnebusch 2001, pp. 20–21. ↑ Hinnebusch 2001, p. 21. ↑ Hinnebusch 2001, pp. 21–22. ↑ Hinnebusch 2001, pp. 22–23. ↑ Hinnebusch 2001, p. 24. ↑ Hinnebusch 2001, p. 28. ↑ Hinnebusch 2001, pp. 29–30. ↑ Hinnebusch 2001, p. 30. 1 2 Hinnebusch 2001, p. 32. ↑ Hinnebusch 2001, p. 33. ↑ Hinnebusch 2001, p. 34–35. ↑ Hinnebusch 2001, pp. 40–42. ↑ Hinnebusch 2001, pp. 2–3. 1 2 3 Hinnebusch 2001, p. 3. 1 2 3 Hinnebusch 2001, p. 4. ↑ Seale 1990, p. 72. ↑ Seale 1990, p. 73. ↑ Seale 1990, pp. 73–74. 1 2 Seale 1990, p. 74. 1 2 Seale 1990, p. 75. 1 2 Seale 1990, p. 76. 1 2 3 4 Seale 1990, p. 77. 1 2 3 Seale 1990, p. 78. 1 2 Seale 1990, p. 500. ↑ Seale 1990, p. 79. ↑ Seale 1990, pp. 79–80. ↑ Mufti 1996, p. 152. ↑ Mufti 1996, p. 153. ↑ Arab News Agency (1963). Mideast Mirror. p. 8. ↑ Mufti 1996, pp. 146–147. 1 2 Rabinovich 1972, pp. 68–69. ↑ Commins 2004, p. 122. ↑ Political Studies and Public Administration Department of the American University of Beirut 1963, pp. 148. 1 2 3 4 Seale 1990, p. 83. 1 2 3 Mufti 1996, p. 157. 1 2 3 Rabinovich 1972, p. 72. ↑ Chronology of Arab Politics. 1. Political Studies and Public Administration Department of the American University of Beirut. 1963. Page 263. Page. 393. ↑ Chronology of Arab Politics. 2. Political Studies and Public Administration Department of the American University of Beirut. 1964. Page 377. Page 412. ↑ Moubayed 2006, p. 38.